This year, we invite all parents to take part in your annual Golf Tournament fundraiser by co-sponsoring a Class Hole! 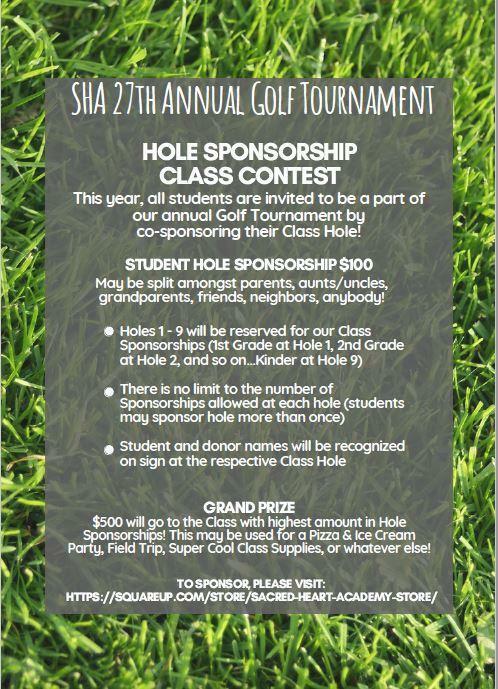 In exchange for your generosity, the class with the highest amount in Hole Sponsorship will win the $500 Grand Prize. This may be used for a Field Trip, Super Cool Classroom Supplies/Technology, Pizza/Ice-cream Party, or whatever the class wants! Each Hole Sponsorship Class registration is $100 (please see class hyperlinks below). This can be split amongst parents, aunts, uncles, grandparents, neighbors, friends, co-workers, anybody! Split the $100 four, five, even ten ways. Our Golf Tournament can instantly raise $20,000 from each family contributing $100. The annual Golf Tournament goal is to raise $24,000 for your child's today's education, for tomorrow’s careers. Sacred Heart Academy is a small school with limited funds to cover basic expenses. Our fundraisers, such as the annual Golf Tournament, subsidize resources to keep Sacred Heart Academy Legacy thriving year after year. Funds from last years’ Golf Tournament allowed us to build a track, and continue programs similar to the 100 Mile Club. All students can benefit from you by taking action to spread the word. Now, let's go out there and DO THIS for our children!